In this type of motor, the series field winding is connected in series with the armature and the supply, as shown in the Fig. 1. Let Rse be the resistance of the series field winding. The value of Rse is very small and it is made of small number of turns having large cross-sectional area. Let IL be the total current drawn from the supply. Supply voltage has to overcome the drop across series field winding in addition to Eb and drop across armature winding. 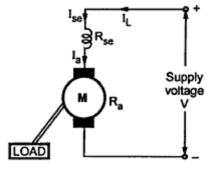 Note : In series motor, entire armature current is passing through the series field winding. So flux produced is proportional to the armature current.